I love holiday travel. The airports are overcrowded, planes are running late, and families are trying to round everyone up to the right place at the right time so they can get back home. It is basically the perfect environment for noticing something out of the ordinary. I’m a (mostly) loyal SouthWest customer. They have good customer service, and reasonable rates. On my flight last week, I also happened to notice that they take kaizen seriously. Kaizen is a word we took from the Japanese invention of Lean process after World War 2. There are different interpretations, and methods that may or may not be mandatory depending on who you talk to, but the most important part is experimentation and discovering what can be done better. 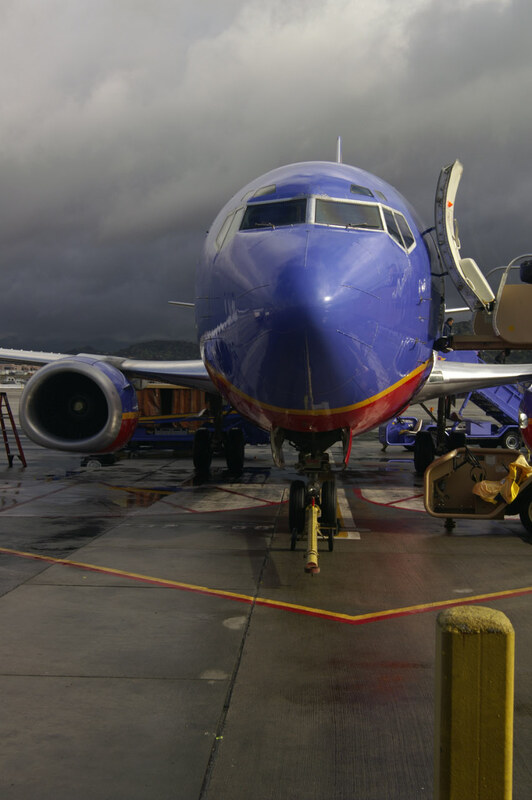 Lets take a look at an example of how SouthWest changes things and aims for efficiency. Our plane boarded a little late, as is traditional for flying the day after Christmas. We got lucky and were able to get seats just a few rows back from the cockpit. The only real benefit there is not having to wait around while people fiddle with their luggage and shuffle out, but it’s important to me. We had been in the air for a few minutes and I was wondering where the person serving drinks was. SouthWest planes have two rows with three seats on each side. I looked up from my book and noticed that our steward was serving each set of three seats before moving on to the next. He would take orders for each of the three people, return to the front to make the drinks, and them bring them back and ask if there was anything else they needed before moving on to the next group. That was totally new to me and it made me realize that SouthWest has consistently been experimenting with in-flight service for the past few years. The iteration before this had stewards taking orders for several rows at a time, and then returning with trays of drinks and handing them out like would be done in a restaurant. One person worked the front of the plane and moved back, and one started at the back of the plane and moved to the middle. When they met in the middle, they were done. And before that, was the iconic drink cart that rolled across the plane front to back. Passengers hoped they didn’t need to move around that full isle blocker. This is Kaizen in action. Making small changes, seeing what happens, and then changing again based on what was learned. Always trying to get a little more efficient, or delivering service just a little bit better the next time. I fly pretty often, at least once a month. It is easy for me to notice changes and things that are just a little bit weird in environments that I jump in and out of, but that isn’t daily software work. Software work is (usually) stable, we work on a schedule with a team and do the same thing a little bit different each week. Making real improvement sometimes takes that manager that spends time watching how the team works and the grooves they get in, or the consultant that dips in to give an outsiders perspective. But, the real outliers are the people with the ability to step outside the cadence of the daily scrum, and releases every two weeks, to see what can be added or removed to make things better next time.